HYDERABAD, India --- Tata Boeing Aerospace Limited today announced the delivery of the first AH-64 Apache combat helicopter fuselage ahead of schedule from its state-of-the-art facility in Hyderabad. The fuselage will now be transported to Boeing’s AH-64 Apache manufacturing facility in Mesa, AZ, for integration into the final assembly line. The facility, which is spread over 14,000-square meters and will be employing 350 highly skilled workers at full production, was inaugurated by Nirmala Sitharaman, Minister of Defence, Government of India, in March this year. 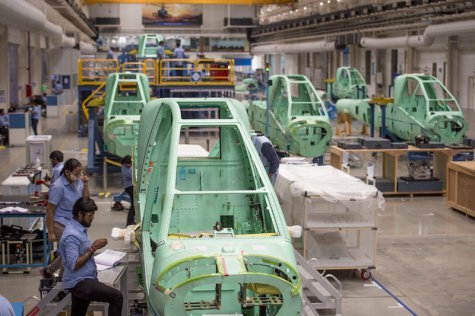 The facility will be the sole global producer of fuselages for AH-64 Apache helicopter delivered by Boeing to its global customers including the U.S. Army. The facility will also produce secondary structures and vertical spar boxes for the multi-role combat helicopter. Tata Boeing Aerospace, Boeing’s first equity joint venture in India, is the result of a 2015 partnership agreement with TASL. Construction of the manufacturing facility began in 2016 and was completed on schedule a year later. In addition, Boeing and TASL have worked closely to develop a pool of highly skilled aerospace talent through skill development initiatives. Today, customers around the world operate more than 2,300 Boeing-made Apache helicopters since the aircraft entered production. The helicopter has been fielded or selected for acquisition by the armed forces of 16 countries, including India. The United States Army Apache fleet alone has accumulated more than 4.3 million flight hours, including more than 1.2 million in combat, as of January 2018.